Browse Rotosound | Musical Instruments | GAK. RotoSound is a guitar and bass string manufacturing company based in England. 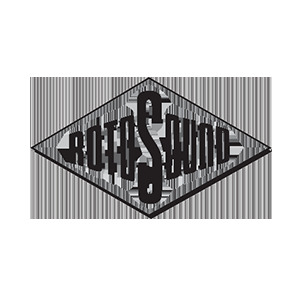 Rotosound's trademark Swing Bass string set was first produced in 1966. John Entwistle of The Who came to the Rotosound string factory looking for an even, heavy roundwound bass string. Entwistle spent the afternoon there, trying string after string before settling on a set that would become known as Swing Bass 66. A fake jingle for RotoSound can be heard on The Who's 1967 album The Who Sell Out. Slightly curved, high-quality, spring-loaded metal guitar capo. Suitable for both electric and steel-strung acoustic guitars. Great quality tie-end normal tension classical guitar strings. Phosphor Bronze Acoustic Guitar Strings. Save -ú-ú-ús on these 7 and 8 string sets from Rotosound. The same great strings, just in the older card packaging. A punchy bottom end with lots of sustain, great for all styles of music. Simple and affordable, chromatic, clip-on headstock tuner for guitar, bass, violin and ukulele.